Deep Chandra X-ray image of the supernova remnant Kes 75. The explosion of a massive star created the supernova remnant, along with a pulsar, a rapidly spinning neutron star. The low energy X-rays are colored red in this image and the high energy X-rays are colored blue. The pulsar PSR J1846-0258 is the bright spot near the center of the image. In its rapidly rotating magnetic fields, the pulsar generates a wind of highly relativistic electrons and positrons, forming the pulsar wind nebula visible as the blue emission region of high-energy X-rays. The nebula is surrounded by a 3' shell emitting lower-energy X-rays. From NASA/CXC/GSFC/F.P.Gavriil et al. Kes 75, also known as G29.7-0.3, located in the constellation Aquila, is a prototypical young composite supernova remnant, consisting of the pulsar PSR J1846-0258 created in the supernova explosion, a nebula of high-energy electrons surrounding the pulsar, and a 3' shell emitting mostly thermal X-rays (top image) and radio (Fig. 1). With an age of about 700 years and an energy loss of close to 1037 ergs/s, PSR J1846-0258 is one of the youngest and most energetic pulsars known in the Milky Way (Gotthelf et al. 2000). Chandra observations show burst-like variations in the X-ray emission from the pulsar. The distance of Kes 75 was initially estimated to about 19 kpc (Becker and Helfand 1984), causing concerns because of the implausibly high X-ray luminosity, but recent determinations favor a closer distance of 6 kpc (Leahy and Tian 2008). Kes 75 appears embedded in a region of relative high gas density (Morton et al. 2007). Its age, the large spin-down power of the pulsar and the dense gas environment make Kes 75 an interesting target for observations in the TeV range, probing the physics of young pulsar wind nebulae as well as cosmic ray acceleration in supernova remnant shells, where the high gas density provides a target for interactions of accelerated nuclei and for production of gamma rays. 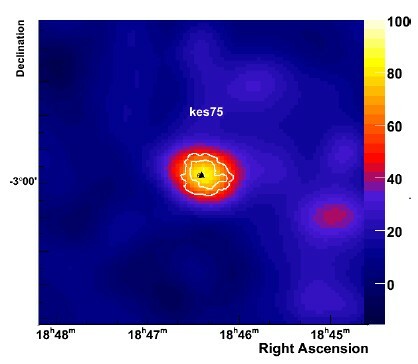 Indeed, Kes 75 was discovered in the HESS Galactic Plane Survey as a source of very high energy gamma rays (Fig. 2), first presented at the 2007 ICRC (A. Djannati-Atai et al. 2007). The latest data set corresponds to 30 h of live observation time, slightly more than presented at the ICRC, and yields a detection with more than 10 sigma significance. The gamma-ray source (Fig. 3) is centered on the remnant and appears point-like; however, a contribution from the 1.5' radius shell cannot be excluded, given that the visible source size is determined by the point spread function of the H.E.S.S. instrument of about 5'-6'. The flux is at the level of about 2% of that of the Crab Nebula. As mechanisms for gamma-ray production, both upscattering of ambient photons by electrons of the pulsar wind nebula or interactions of protons accelerated in the shell are possible; the low gamma-ray luminosity implies, however, that cosmic-ray acceleration in the remnant is not too efficient, with not more than about 10% of the explosion energy converted into high-energy cosmic rays. Reference: "New Companions for the lonely Crab? 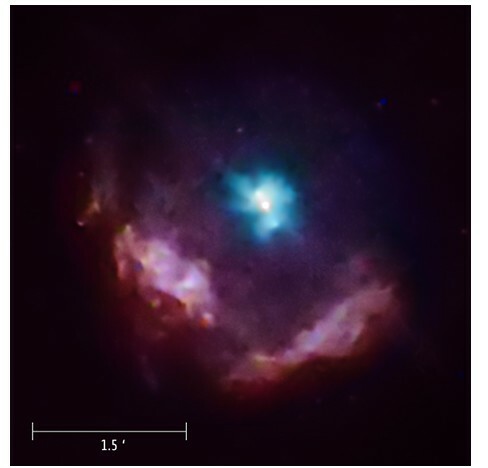 VHE emission from young pulsar wind nebulae revealed by H.E.S.S." Fig. 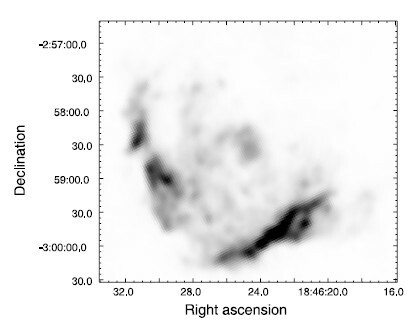 2: Section of the HESS Galactic Plane Survey, showing Kes 75 as the faint source HESS J1846-029 at about 30 degr. galactic longitude.